Rich soil with a near neutral Ph. Full sun in cool climates, partial afternoon shade where summers are very hot. Echinacea is a hardy perennial that survives very cold winters. Plants become dormant in winter and re-emerge in spring. Spread rich compost over the dormant plants each winter. Monarda. 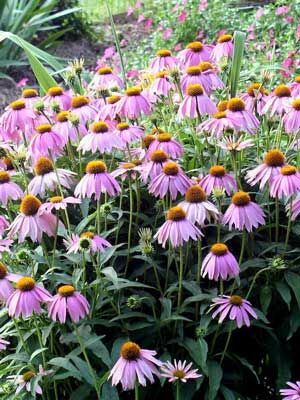 Echinacea’s purple blossoms contrast well with pink, yellow or orange flowers. Start seeds indoors in late winter and set out seedlings, or start with purchased plants. Echinacea often does not bloom reliably until its second year in the garden. Echinacea is grown for its beautiful flowers and for the medicinal properties of teas and tinctures made from roots, leaves and flowers. Dig plants in early fall to harvest the roots. Small divisions with skimpy root systems can be replanted and allowed to grow for another year. For enhancing immunity to colds, echinacea tinctures or teas are taken every few hours for several days. It is not known whether or not colorful new varieties of Echinacea have medicinal properties that compare to older strains, which are preferred by butterflies.